Map that brought the French into the American Revolutionary War. Carte du Theatre de la Guerre entre les Anglais et Les Americains. 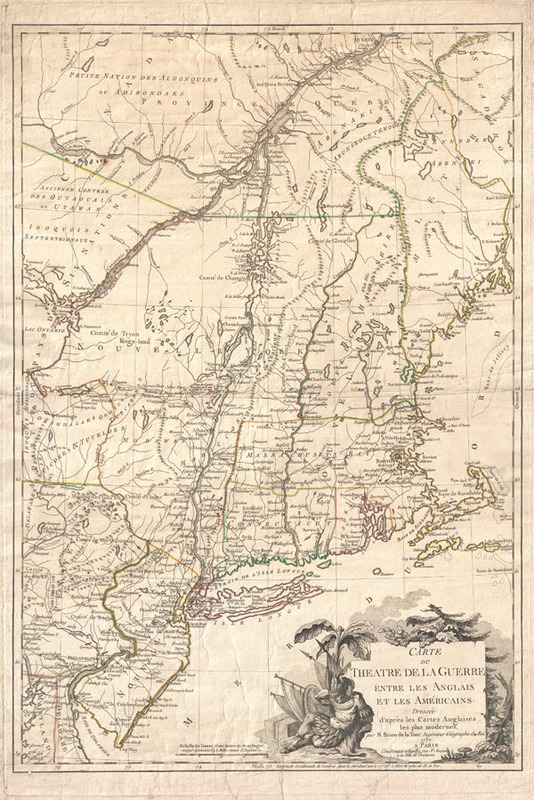 First edition example of an extremely significant map of New York and New England. Issued by Brion de la Tour in 1777, this map was intended to illustrate the important events at the height of the American Revolutionary War. Brion's map covers from the Delaware and Chesapeake Bays northward as far as Quebec City, inclusive of New York (with modern day Vermont), New Jersey, Massachusetts, Connecticut, New Hampshire, and parts of Pennsylvania, Maryland, Delaware, Maine and Canada. Shows both political and topographical detail including mountains, rivers, roadways, regional boundaries, American Indian nations, towns, and cities. The significance of this map stems not only from its sophisticated cartographic representation of the region, but also for its notations regarding the October 16th Battle of Saratoga and the subsequent surrender of the British Army of General John Burgoyne. Considered to be the major turning point in the American Revolutionary War, the Battle of Saratoga was precipitated when General Burgoyne led a large force of British and German soldiers through parts of New York and New England with the intention of dividing New England from the southern theater of war. In a series of strategic maneuvers American soldiers under Horatio Gates and Benedict Arnold (before he changed sides) surrounded Burgoyne at Saratoga, forcing his surrender. This event, beautifully illustrated in this French map of the area, convinced the French King Louis XV to officially support the American Revolutionary efforts. By joining the Revolutionary War on the side of the Americans, the French and later the Spanish, turned the war from an internal matter between Britain and its colonies into a global conflict. Several editions of this map appeared in 1777, 1778, 1779 and in a reduced size in 1782. This edition, the first, is considered the most important, valuable, and desirable. This map is the first published illustration of the Battle of Saratoga to appear in France and responded directly to French interest in the American Revolutionary War associated with their subsequent involvement. Though most known examples exhibit a centerfold, like this one, Brion's map of the Theater of War in America was a separate issue and not associated with any specific publication. Drawn by Brion de La Tour and published by Esnauts et Rapilly from their on Rue St. Jacques a la Ville de Coutances. Scale 1:1,200,000. Very rare and a must have for any collection focused on the American War of Independence. Very good. Even overall toning. Wide margins all around. Verso reinforcement and margin repairs at top and bottom. McCorkle, B. B., New England in Early Printed Maps 1513-1800: An Illustrated Carto-Bibliography, 777.6. Nebenzahl, Kenneth, A Bibliography of Brinted Battle Plans of the American Revolution, 1775-1795, 121. Library of Congress, Map Division, G3710 1777 .B71 Vault. Sellers, J. R., and Van Ee, P. M., Maps and Charts of North America and the West Indies 1750-1789, 728.